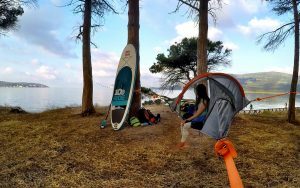 After a wonderful honeymoon in South East Asia, Fabrizio and Lohene are back in Sardinia feeling more passionate about the coming season than ever before. So, yes, love is definitely in the air. But it’s also in the water, where you’ll fall off your SUP with new found friends on the Bosa River. You’ll even find love in the sand that will press between your toes during morning yoga sessions, and in the light of the fire where you’ll cook supper before toasting your face in the glow of white flames. Because you are coming this year, aren’t you? A new concept for 2019 is the 2 day digital detox adventure. That’s right, it means letting go of your phone and all the burdens that come with it – for two blissful days. The really cool thing is that you start to feel the benefits after just a few hours. And you’ll be too busy adventuring to miss anything that requires an internet connection. 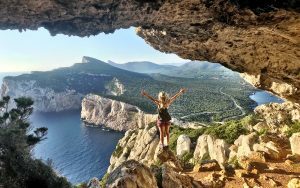 Of course, the therapeutic effects of doing yoga in nature, hiking wild trails and paddling on the Sardinian coast, are enough to make anyone feel good. But the digital detox can help you to be calmer, to sleep better, to improve your posture and even your relationships. As a result, you’ll find that you’re much more productive when you switch back on. So if you come on one of these you’ll be feeling supercharged by Monday morning, and looking forward to unplugging again soon! Imagine hiking through wild and rocky scenery, feeling the buzz of your own natural high. Then you decide to reach out and touch some of the things you around you. The firm tight leaves of an olive tree or the abrasive surface of volcanic rock. Or maybe something touches you – like an extra large cricket that lands on your hand to check you out. It’s at moments like these that you realise the power and simplicity of living life in close contact with nature. Now put some people into the picture. You’re part of a community – a little tribe keeping each other company, finding your way together and helping each other when you run into trouble. 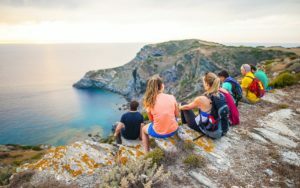 Well, this is not just part of our concept, it’s part of the lifestyle that makes Sardinia one of the world’s five blue zones (where a high number of people live to be a hundred or more). Of course, there are other secrets to living this long and healthy life. The Mediterranean diet for one, including the local Cannonau wine. And most importantly, the lifestyle that keeps people constantly active in this beautiful landscape. If you’re ready for a taste of this Sardinian elixir, you should check out our Blue Zone 3-day adventure in and around Cala Gonone. It’s a guaranteed, unforgettable experience!